While most folks bundle up during the winter months we have found that there is as much to do in January as July. Starting in the fall hunters will find the area is great for Deer, Turkey, Waterfowl, and Doves. 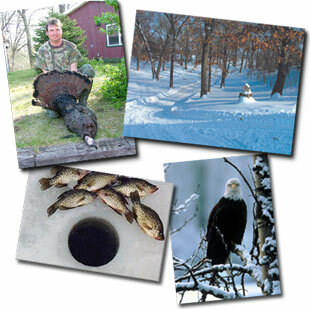 There are plenty of public hunting areas - Big River State Forest and the Mississippi River are both open to the public but may have special regulations. Contact the Illinois DNR for specifics. As fall turns into winter, the available activities include winter sports such as cross-country skiing and snowmobiling. The state forest offers excellent opportunities for both. When the chill of winter really starts to bite ice fishing becomes a favorite activity. If you prefer to snuggle up under a warm blanket you can enjoy some of the best bird watching in the upper Mid-West right from your cabin window. Bald Eagles can be seen on a regular basis from the Middle of December through February. A wide variety of other species can be seen year round since we have several bird feeders out around the cabins at all times.